We Just Love Them - how could we not?????? This page is under development. Rather than wait until it is complete (since it seems to be taking literally years), I've decided to at least get started and edit it and add to it as the spirit moves. Check back often as I'll be adding paragraphs as I put my thoughts together. 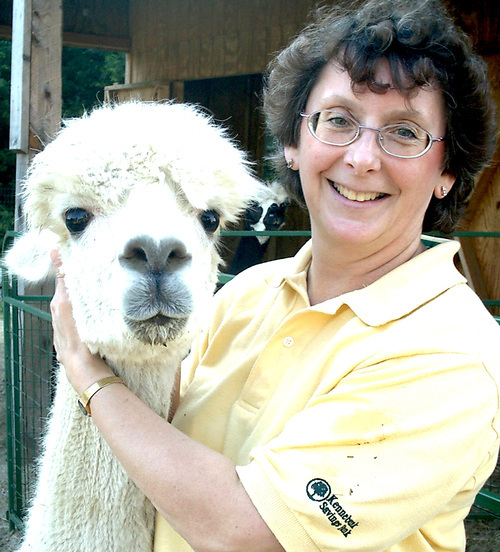 When we started with alpacas in 2001, a frequently asked question posed to us was “What do you do with them?” We answered that question in the same manner as all the other alpaca farmers, with explanations about the fiber and it’s comfort and warmth. Now, 16 years later, we have a shorter answer – We just love them. Yes, the fiber has many positive characteristics and we use all of the fiber produced. 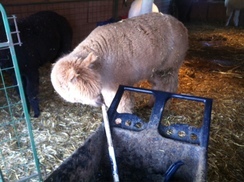 Yes, they are relatively easy livestock to take care of – but we just love the alpacas themselves. Each alpaca is an individual. Yes, they all have names (another common question). They each have their own certain looks, characteristics, mannerisms, habits, and disposition. 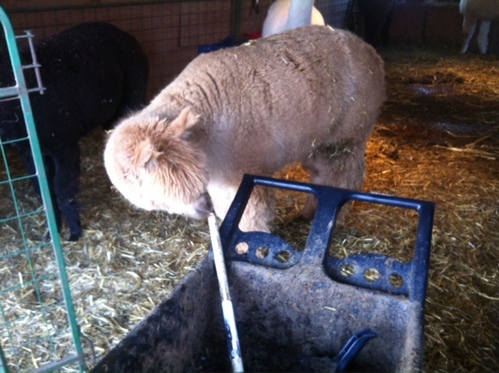 Another common question because we have mostly white alpacas – How do you tell them apart? Their faces are all different, although we sometimes have to look twice as we have some offspring who bear a strong resemblance to a parent or sibling. They each have different shaped heads, different body shapes and sizes, and slightly different color markings. In short, they are each unique. And did I mention that we just love them? Our original plan was to breed alpacas and sell them to others who wanted to do the same. Harvesting the fiber was, of course, the underlying reason to raise them, and it was a secondary source of income after sales of offspring. We put off facing the "who do we sell?" question on the premise that we would "grow our herd" to a suitable size that would give potential buyers a good selection to choose from. We dipped our toes into the show arena, both halter shows and fleece shows. At that time the New England Coastal Classic Alpaca Show was at Pineland in New Gloucester. Since it was so close (as compared to driving to central/western Massachusetts or Vermont for the next closest shows) I felt that I should push outside my comfort zone (introvert), take a leap of faith, and show at NECC. There were definitely some exciting times over the 3 or 4 years that we showed - Misty May took two 2nd places in our first show, Deion took an exciting 3rd when he showed, Picabo took a 4th, and Arlo took 1st place in both halter and fleece, and a Reserve Championship! There were other ribbons for other alpacas at numerous fleece shows. 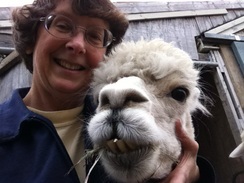 While that was all fun and definitely exciting, it was also very stressful on both of us and the alpacas. So, getting back to just loving them. So many issues to deal with before, during, and after a show - are they well-enough halter trained, will we have a downpour the day before the show and they'll look like drowned rats and not make a good impression to the judge, will they load into the trailer, will they behave once we get there, will the stress of all this cause health problems for them (and us!!! 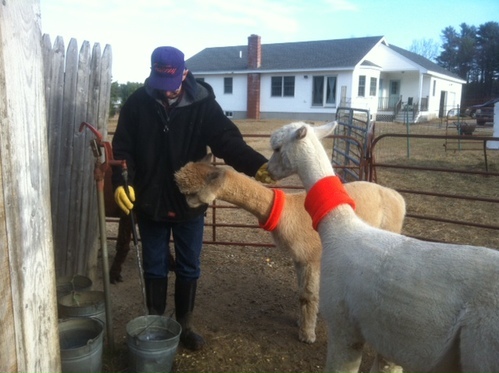 ), will they catch something from other alpacas, we have to segregate them for a few weeks once they come home from a show so as not to expose the rest of our herd in case they did pick up something, and on and on and on. 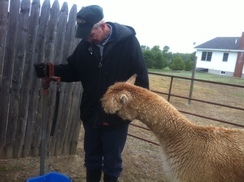 We don't miss this part of the "alpaca lifestyle" at all. All of these issues are now behind us and we don't have to worry about them any more. What a relief!